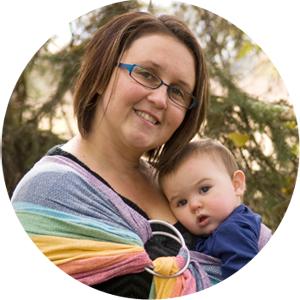 Comfybuns Customs is yet another terrific WAHM-run company, headed up by Jessica from British Columbia, Canada. Having started out making cloth baby wipes, Jessica has also expanded her eco-friendly handmade customs to include wipes of a variety of shapes, sizes, and patterns--perfect not only for diaper changes but also for sticky fingers, hands, and even household use! 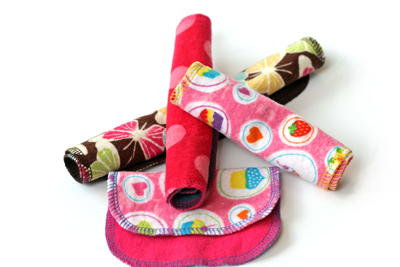 She has also broken into creating "un-paper towels", a terrific eco-friendly option to using throwaways in the kitchen. Easy to store dirties in a wetbag and wash up with diaper or regular laundry on wash day, all of Jessica's wipes are cute, soft, and receive my recommendation! 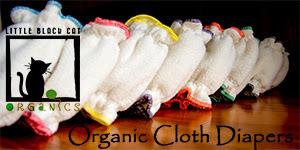 Really, there are no designated uses for these, but as I mentioned above, they could all be useful for hands, fingers, bums, or even as family cloth! I actually liked having some selection with the sizes. I found that the "petite personal" wipe was very handy for simply wiping up after a pee diaper, or even for use just dabbing dry after giving Baby's bum a really wet wash-down. 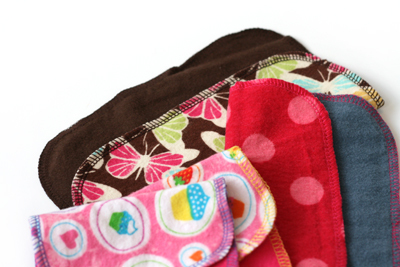 The medium sizes were fairly standard in comparison to other cloth wipes, and the large, "perfect" wipe was indeed "perfect" for tackling those scary, uber-messy diapers (the ones where you want maximum surface area so your own bare hands don't have to become involved in clean-up duty!). 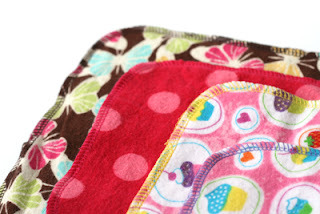 In terms of aesthetic appeal, I love Comfybuns Customs' cute prints and colors--these sweet wipes have a different pattern/color combo on each side so that livens them up a bit and gives them that true "custom" look. The cloth is a supersoft flannel that remains tender and smooth even with multiple washes. As with any flannel, the fabric does start to pill a little with multiple washes & dries, but not to a concerning extent, and the colors have still stayed vibrant and the fabric soft & smooth. I actually prefer these wipes nowadays to some of the more terry-textured ones I've tried in the past as I feel that the terry texture can really do a number on rubbing off tender new skin trying to heal up on a rash or even a sensitive bottom. Overall I highly recommend these wipes and am happy to help support a work-at-home-mom, especially one from Canada! :) To see all that Jessica has to offer, be sure to check out her Facebook page (including photo albums) and her blog as she's always coming up with new creations, deals, and even giveaway celebrations & sponsorships! Head over to the Comfybuns Customs' Facebook-based shop to check out all the latest custom-priced deals & bundles up for grabs with these reusable, eco-friendly wipes. EXCLUSIVE BONUS: Also, if you place an order within the next two weeks and mention that you've read this review, Jessica will throw in an additional free gift when she ships your order out! Comfybuns Customs is also offering TWO lucky winners a "Test Drive" wipe set each (each set contains 1 "Perfect" 8x8 wipe & 2 "Petite Personal" 6x4.5 wipes). Winners select gender. Final details: I received no financial compensation for this review or giveaway, though I did receive the sample items free of charge. All opinions shared are my own, and I was not persuaded to share anything other than my own thoughts. Other users may have different experiences with this product than what I have shared. This giveaway will end on July 23, 2011 at 11:59pm MST and is open to residents of Canada and the USA only. Winner will be chosen randomly using random.org’s services. The winner will be contacted by email and will have 48 hours to reply before a new winner is chosen. The prize will be supplied and mailed out to the winner by the sponsor of this giveaway. I like you guys on Facebook under Kristina Brown! I follow your blog via GFC as samantha. Follow comfybuns customs blog via GFC as samantha. 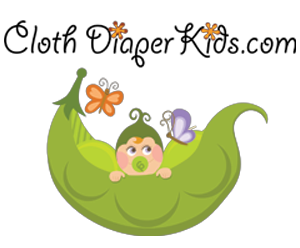 I like cloth diaper contests and giveaways on fb as Samantha Allen. I follow you on GFC as "Brooke-Brookies Baby Bargains"
follow comfybuns on GFC as "Brooke - Brookie's Baby Bargains"
I like Cloth Diaper Contests & Giveaways on Facebook! I like Comfybuns Customs on Facebook! I follow you thru GFC!!! daily vote at picket fence! I like Cloth Diaper Contests and Giveaways! GFC follower at Comfybuns Customs.